The terrorist who ran over four police officers in Jerusalem on Saturday night has been arrested by security officials. Scene of car terror attack. 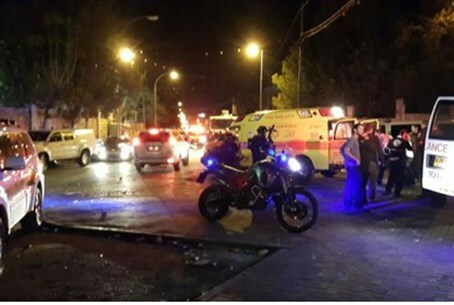 The terrorist who plowed down four people on the Kohanim Route in eastern Jerusalem neighborhood a-Tur on Saturday night has been arrested by intelligence officers and Border Patrol guards. A resident of the Shuafat refugee camp in eastern Jerusalem, he is now being interrogated by the Special Operations Squad of the Jerusalem Central Unit. Four police officers were wounded in the attack. A policewoman in her 20s is in moderate condition, with wounds to the pelvis and extremities. The three other officers are lightly injured. Magen David Adom medics gave the four initial care before evacuating them to Shaare Zedek Medical Center in the capital. The car that carried Jerusalem Mayor Nir Barkat to the location of the attack also came under assault when Arabs threw rocks at it. A rock caused light damage to the car but hurt no one. Saturday night's attack was the third such terror attack targeting Jews in 24 hours. A Border Policeman was wounded Saturday after being stabbed by a terrorist outside the Cave of the Patriarchs in Hevron. Another terror attack was foiled Friday night, when an Arab youth aged 16 tried to stab a female Border Police officer at the A-Zaim checkpoint in eastern Jerusalem. Policemen at the checkpoint shot and killed him. The policewoman was not hurt.